Specializing in events, SUD VTC offers high-end transport services to help ease the process of planning transportation. Our wedding day is one of the most important days in our lives. You deserve to have the best transport service. SUD VTC is specializing in such occasions. For your wedding day, we can arrange flowers on the cars that will match your color scheme and wedding theme. On the day; your private chauffeur will take care of everything so that you are completely satisfied. If need be, we can also schedule the luxury car to be in the photo shoot with the wedding couple. SUD VTC is at your disposal to ensure an exceptional service: luxury vehicles with all the comfort that you can imagine, presentable chauffeurs and professionalism, to make your day unforgettable. 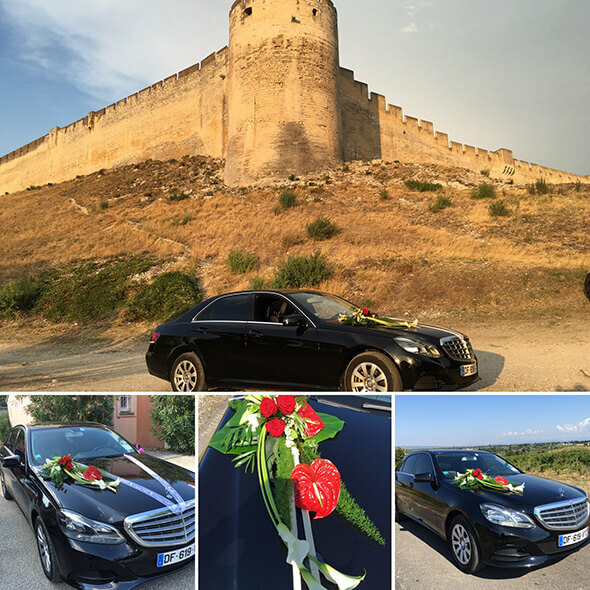 Official visits, galas, private or professional outings, promotional tours... for all of your events, SUD VTC will accompany you with a private chauffeur and transportation to all of your destinations ensuring that everything goes accordingly to plan. Known for our professionalism with enterprises and private companies, our chauffeurs are at your disposal and can adapt to any type of event. We can offer you a large variety of services that fit your schedule and needs. Our SUD VTC drivers know the area well, and you can count on them to show you around while you're at your event. Hotels, restaurants, event halls, just ask and they'll be happy to help you optimize your day. Do you need a private chauffeur for your wedding or event? Contact us today to book your chauffeur and luxury car!